Do you know your store number? There’s something about the start of a quarter that prompts toiletries to run out and a thousand unusual health needs to manifest themselves. Wednesday I woke up with a cold; this morning my deodorant fell to pieces; and let me mention discreetly that there have been certain other feminine needs asserting themselves this week also. Every quarter the reasons are different but the resulting and recurring trips to CVS are always the same. The real danger in these trips is that they give one the opportunity to buy the things that one has been sort of wanting but wouldn’t probably make a trip for. For example: the pumice sitting here on my desk next to the kleenex and pseudo-fed (I always buy CVS brand). No joke. I’m completely stumped by the implications of this. Has CVS had a number of shipments go missing and turn up at Target? Are there rogue drugstores brazenly selling illicit CVS merchandise? My mind is particularly boggled by the fact that the address of my local CVS is included on the label. That seems to suggest some kind of internal spat among individual stores. Maybe store #3901 has been having trouble with those bastards at #2986 who keep holding back all the good stock for themselves. I’m really tempted to call that number except I doubt it will actually clear anything up. Usually there are only about five back here, and not nearly as motley a collection as these are. 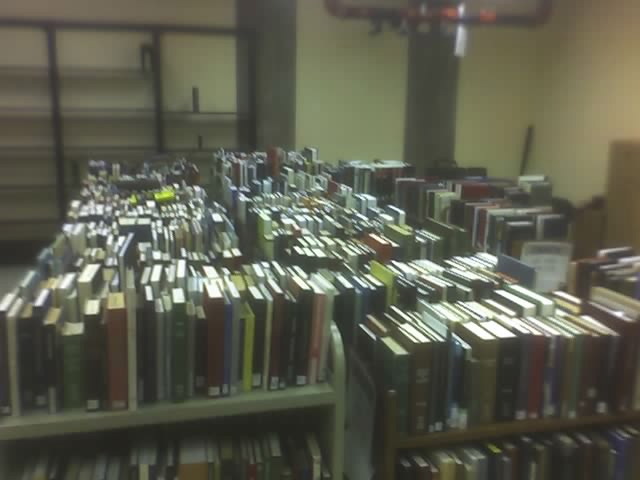 My contacts in Circ tell me that last night they ran out of trucks and had to just leave some books stacked up in bins. With courses and papers and theses finished, suddenly all those little hoards of books start to come home. Looking at these, I can imagine the stacks in carrels and offices and apartments; there are few things more evocative of the workings of a human mind than a collection of books. And now they all find their way back up to their places in the towers to wait for their next big break. Very sentimental; so be it. It’s the end of the year, the start of the summer, the cusp of senior year and everything that comes after. It’s big. And while I’m sure it’s going to be wonderful and exciting, and I’m sure I’ll be able to handle all the concerns that come up, I still have to bring those books back, so to speak. I have to bring those books back, the ones that have been occupying large quantities of space, that have answered my questions and kept me company and infuriated me, and they have to go back where I might not be able to find them again. And if I do, it will be in a completely different context, since the previous project will be done. Enough with the lame book metaphors. It’s nearly four and my stuff is emphatically not ready for checking out at 10am. This is just a reminder that there will be wine served at the end-of-the-year reception (see notice emailed on May 31) and that you will be carded. The caterer’s bartenders have the right to refuse service if proper ID is not presented. No. No, beauty products really are not the best Father’s Day gift, unless you’re buying a refill. And what do you want with making your father “look good”? Ew. Tell the one about your computer’s built-in cup holder! 1. Dell hasn’t used that slogan since its pitchman got busted for pot, which happened in 2003, unless they’ve revived it without my knowing. While it can be used effectively in relation with this story, this botched parody makes it sound like the author thinks the slogan is current. 2. Facebook has been open beyond college students for a pretty good chunk of time now (Sept 2006), and even before that, faculty and grad students could have accounts. So not only is the smirky teens versus grown-ups “joke” obnoxious as hell, it would have been inaccurate last fall even if slightly more appropriate and timely. 3 & 4. AOL and Larry King are fair game. 5. …. *gobsmacked* ….. Seriously, this lost wallet joke would have been old-fogeyish ten years ago. Leave it to Doug Larson, dude. Will the apartment be the place where you want to study or party or both? What are the prospective roommate’s habits? Does he or she smoke? (Do you?) What about alcohol or drug use? What about musical tastes? Does reggae or jazz get on your nerves? My only requirement is that my roommate have a good dealer. Consider living habits. Remember the Odd Couple—Are you like Felix or Oscar? It may seem trivial at first, but small things like leaving dirty dishes for days, drinking milk out of the carton, or not flushing the toilet can become very irritating over time. This would never seem trivial to me. How do you feel about guests sleeping over? Waking up with your roommate’s boyfriend or girlfriend, friends from home, or the whole wrestling team can be a memorable experience. Occasionally. But there’s nothing worse than feeling uncomfortable in your own apartment. If your roommate has frequent guests, and if they empty the refrigerator, hog the PlayStation, or run up the phone bill, they can ruin your life and studies. D’ya get the feeling we’re missing a prepositional phrase here? Or are we saying it’s ok to wake up with your roommate’s boyfriend in your bed every once in a while? Want to read something utterly fascinating? Let me recommend to you Bab: A Sub-Deb, a title described by James Lileks as “sound[ing] like a novel written entirely in the voice of someone with a head cold”. The premise is that Barbara (“Bab”), a 17-year-old itching for her debut, has written essays and diary entries about her various comic mishaps. I thought the stories themselves were entertaining enough — in the same genre as the Jeeves stories, except that the clever-linguistics angle is supplied by Bab’s poor spelling and overdramatic sensibilities. But the book becomes absolutely absorbing when you keep in mind as you go that this girl is seventeen, and that the backdrop is 1917 America and all that goes along. It’s not that you get little glimpses of the past; you find yourself transplanted by the author’s assumptions about her audience into someone else’s world. Well, I do, anyway. Can you imagine this sort of thing? I spent the morning with mother at the dressmakers and she chose two perfectly spiffing things, one of white chiffon over silk, made modafied Empire, with little bunches of roses here and there on it, and when she and the dressmaker were hagling over the roses, I took the scizzors and cut the neck of the lining two inches lower in front. The effect was posatively impressive. The other was blue over orkid, a perfectly passionate combination. Eddie Perkins saw me there and came over. He had but recently been put in long trowsers, and those not his best ones but only white flannels. He was never sure of his garters, and was always looking to see if his socks were coming down. So here I sit, Dear Dairy, while there are sounds of revelery below, and Sis jumps at her chance, which is the Honorable Page Beresford, who is an Englishman visiting here because he has a weak heart and can’t fight. Mother rose and made a sweeping gesture with her right arm. It’s just too cool. And it’s completely irrelevant to my final papers/exams. ETA: Ye gods! Socialism! This book just keeps getting better! ETA2: It. Does. Not. Stop. I meant to ask father tonight, but he has just heard of Beresford and is in a terrable temper. He says Sis can’t marry him, because he is sure there are plenty of things he could be doing in England, if not actualy fighting. “Do I understand that you forbid him the house?” Leila asked, in a cold furey. One last addition: The last chapter is effing MIND-BLOWING.